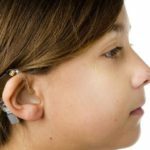 Cochlear implants have been around since 1982 and are approved by the FDA. As of December 2012, approximately 324,200 registered devices have been implanted worldwide. In the United States, roughly 58,000 devices have been implanted in adults and 38,000 in children. Cochlear implants are typically intended for patients 12 months and older who have a severe to profound sensorineural loss in both ears with poor word understanding and limited or no benefit from hearing aids. We currently offer the Nucleus 3 System (implants and speech processors) from Cochlear Americas (formerly Cochlear Corporation). These are the most widely used cochlear implants in the world. Our otologist, Michael Marsh, M.D., spent 1-1/2 years in Australia as Co-Director of the University of Melbourne Implant Clinic with Graeme Clark (the originator of the cochlear implant) and his team, the developers of the Cochlear Americas implant. He is the only US surgeon to have done so. A cochlear implant is an electronic device that essentially replaces the cochlea (inner ear organ of hearing) by performing the task of the damaged or absent hair cells, which is to provide electrical stimulation to nerve fibers in the cochlea. There are two components of a cochlear implant, the internal implant and the external speech processor. The internal implant is surgically implanted under the skin and consists of a receiver/stimulator, antenna, magnet, internal electrode array and grounding lead. The electrode array is inserted directly into the cochlea. Currently there are two choices for the external speech processor, a body-worn device and an ear-level device which resembles a behind-the-ear style hearing aid. Additionally there are many accessories that enhance the ability to hear music, the television, on the telephone, in background noise, in theaters, in the car, at places of worship and at restaurants. The directional microphone in the headset of the processor picks up sound and delivers the sound to the speech processor via a cable/cord. The speech processor then analyzes and filters sound into digital information and a coded signal. The coded signals are then sent to a transmitting coil worn on the back of the patient’s head. The coil sends the coded signals to the internal implant. Electrical energy is then delivered to the electrode array. The electrodes stimulate surviving auditory nerve fibers and the electrical sound information is interpreted by the brain. The speech processor is able to utilize various “speech coding strategies” to help improve or maximize the benefit and understanding received from an implant. A coding strategy describes the way in which the processor interprets loudness, pitch and timing cues to send signals to the cochlea. Having a choice of coding strategies allows for flexibility and individualization for each cochlear implant patient. Considering a decision to receive a cochlear implant is a serious but exciting process. However, the decision to be implanted requires a total commitment from the patient/parents, realistic expectations and the availability of a support system. Research and experience show that without active commitment, benefits from the implant are limited. Please refer to the section below entitled “Factors Affecting the Degree of Benefit from an Implant” for more information about the commitment required. Although an implant will enable better hearing and should improve the ability to communicate, realistic expectations are a must. Implant recipients progress at their own individual pace and should never compare their progress to another recipient’s progress. Developing the ability to use and hear with an implant is not an immediate or overnight process. The implant is not an immediate cure preventing patients from ever having trouble communicating again. It is highly possible that in the beginning patients will have significant difficulty hearing or understanding with the implant. Some patients are able to immediately enjoy and understand what they hear during their initial mapping session, however many patients with implants describe the initial sound quality as robotic, mechanical or similar to a cartoon character (Mickey Mouse or Donald Duck). Other patients find their initial exposure to sound overwhelming, strange and perhaps annoying. With time every patient experiences significant improvement, step by step. Improvement depends upon the amount of time and effort invested in the rehabilitation process. This is why the support of family members or friends is extremely important. It is important to have other people available who can help practice listening. The process can be likened to learning to hear all over again, and can sometimes be compared to learning a new language. Sometimes the support of a psychologist or counselor is needed to assist with the coping process associated with adjusting to the implant. When and How is the Implant Activated? Initial programming of the speech processor occurs at approximately three to four weeks after surgery. The programming of the device is called “mapping.” Mapping sessions involve choosing the speech coding strategy that will be used by the speech processor as well as which electrodes will be stimulated. Comfort levels are chosen during these sessions. Other parameters may also be manipulated by the audiologist(s) to assist in finding the optimal listening program for each patient. During the first year after implantation several mapping sessions will be required. If you are interested in learning more about cochlear implants or the surgical process please feel free to contact our office at 479-242-4220.